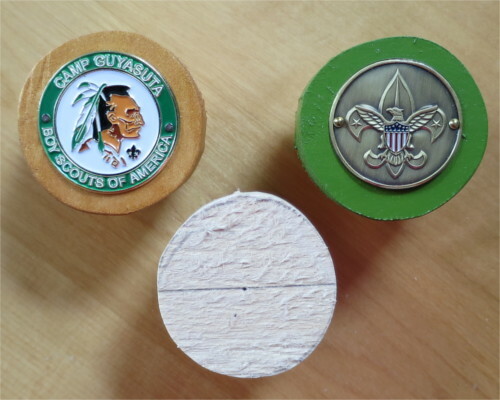 This no-carving beginner project provides an easy way to turn a medallion into a slide: just sand, paint and attach the badge of your rank, council or camp, school, or town. Slide is 1/2" thick to allow for nails as well as glue. Medallions are sold at visitor's centers or online (search for "walking stick medallion" or "walking stick badge.") Medallions can be any shape up to 2" across. BSA and Camp Guyasuta logos are property of their respective owners.